Diffraction and Imaging Techniques in Material Science reviews recent developments in diffraction and imaging techniques used in the study of materials. It discusses advances in high-voltage electron microscopy, low-energy electron diffraction (LEED), X-ray and neutron diffraction, X-ray topography, mirror electron microscopy, and field emission microscopy. Organized into five parts encompassing nine chapters, this volume begins with an overview of the dynamical theory of the diffraction of high-energy electrons in crystals and methodically introduces the reader to dynamical diffraction in perfect and imperfect crystals, inelastic scattering of electrons in crystals, and X-ray production. It then explores back scattering effects, the technical features of high-voltage electron microscopes, and surface characterization by LEED. 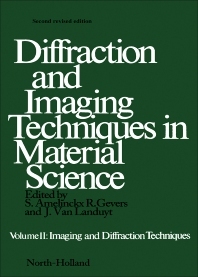 Other chapters focus on the kinematical theory of X-ray diffraction, techniques and interpretation in X-ray topography, and interpretation of the contrast of the images of defects on X-ray topographs. The book also describes theory and applications of mirror electron microscopy, surface studies by field emission of electrons, field ionization and field evaporation, and gas-surface interactions before concluding with a discussion on lattice imperfections. Scientists and students taking courses on diffraction and solid-state electron microscopy will benefit from this book.